Objective: To compare the efficacy and safety of etanercept and sulfasalazine, alone and in combination, in patients with active rheumatoid arthritis despite sulfasalazine treatment. Methods: A double-blind, randomised study in adult patients with active rheumatoid arthritis despite stable sulfasalazine (2–3 g/day) treatment. The primary end point was a 20% response by the American College of Rheumatology (ACR) criteria at 24 weeks. Results: At baseline, the three treatment groups (sulfasalazine, n = 50; etanercept, n = 103; etanercept and sulfasalazine, n = 101) were comparable for demographic variables and disease activity. Lack of efficacy was the primary reason for discontinuation (sulfasalazine, n = 12; etanercept, n = 1; etanercept and sulfasalazine, n = 4; p<0.001). Significantly more patients receiving etanercept, alone or in combination (74% for each), achieved ACR 20 responses at 24 weeks than those receiving sulfasalazine (28%; p<0.01). Similarly, more patients in the etanercept groups achieved ACR 50 and ACR 70 responses than those in the sulfasalazine group (p<0.01). In the groups receiving etanercept, significant differences in the ACR core components were observed by week 2 compared with those receiving sulfasalazine alone (p<0.01). The incidences of several common adverse events (headache, nausea, asthenia) were lower with etanercept alone than with the combination (p<0.05), but infections and injection site reactions were higher with etanercept alone (p<0.05). The safety profiles of both etanercept treatment groups were comparable with previous experience of etanercept. Conclusions: For all efficacy variables assessed, etanercept alone or in combination with sulfasalazine resulted in substantial and similar improvement in disease activity from baseline to week 24 compared with sulfasalazine alone in patients with active rheumatoid arthritis despite their sulfasalazine treatment. All three treatments were generally well tolerated. Etanercept is a soluble dimeric fusion protein consisting of two human 75-kDa tumour necrosis factor (TNF) receptors linked to the Fc portion of human immunoglobulin (Ig) G1.4 The binding of etanercept to TNF results in a considerable reduction in the inflammatory activity associated with rheumatoid arthritis. Etanercept, alone5,6 and in combination with the disease-modifying antirheumatic drug (DMARD) methotrexate,7–9 has been shown to be effective and well tolerated in the treatment of rheumatoid arthritis. In the trial of etanercept and methotrexate with radiographic and patient outcomes (TEMPO) on patients with active rheumatoid arthritis, Klareskog et al7 observed that after 6 months of treatment, the combination of etanercept and methotrexate was superior to either treatment alone in reducing the signs and symptoms of rheumatoid arthritis and in improving functional disability. Although methotrexate is the most widely used DMARD in the treatment of rheumatoid arthritis, studies have shown that sulfasalazine is also effective in controlling disease activity.10–15 Currently, there are no data from controlled trials on etanercept with sulfasalazine in the treatment of patients with rheumatoid arthritis. Here we report the 6-month data from a 2-year double-blind study evaluating the efficacy and tolerability of etanercept added to sulfasalazine, etanercept alone and sulfasalazine alone in patients with active rheumatoid arthritis whose symptoms were not adequately controlled with sulfasalazine treatment. This double-blind, randomised, parallel, multicentre study was conducted on patients who had active rheumatoid arthritis despite treatment with sulfasalazine. Eligible patients were ⩾18 years of age with disease duration ⩽20 years who had active adult-onset rheumatoid arthritis (functional class I–III),16 defined as ⩾6 swollen and ⩾10 painful joints, and at least one of the following: erythrocyte sedimentation rate (ESR) ⩾28 mm at the end of the first hour, serum C reactive protein (CRP) ⩾20 mg/l or morning stiffness ⩾45 min. Patients must have received stable doses of sulfasalazine (2–3 g daily) for ⩾4 months before screening, without signs of toxicity. Patients were ineligible if (1) they had received etanercept or other TNF antagonists or (2) if they had received a DMARD other than sulfasalazine within 3 months before baseline. Other exclusion criteria included the use of any immunosuppressive biological agents or cyclophosphamide within 6 months before screening, parenteral corticosteroids within 4 weeks before screening, and the presence of relevant comorbidity, including active infections. Patients were permitted stable doses of oral corticosteroids (⩽10 mg/day of prednisone or equivalent), one non-steroidal anti-inflammatory drug, simple analgesics with no anti-inflammatory action or daily doses of aspirin (⩽300 mg) during the study. Patients with diseases that included cancer, congestive heart failure, uncontrolled hypertension, severe pulmonary disease, leucopenia, renal disease, thrombocytopenia or connective tissue disorders other than rheumatoid arthritis were not included. Pregnant or breastfeeding women were also not included. The study was conducted in accordance with the International Conference on Harmonisation guidelines for Good Clinical Practice in the European Community and the Declaration of Helsinki. Ethics committees of the participating centres approved the study protocol. Patients gave written informed consent before participation. Patients were randomly assigned to one of three treatments for up to 24 weeks at a 2:1:2 ratio: etanercept (25 mg subcutaneous injections twice weekly and oral placebo once daily); sulfasalazine tablets (2, 2.5 or 3 g daily and subcutaneous placebo twice weekly); or etanercept and sulfasalazine (subcutaneous etanercept 25 mg twice weekly and sulfasalazine 2, 2.5 or 3 g once daily). All patients received identical-appearing injectible and oral test articles. Patients receiving sulfasalazine continued to receive their pre-study dose. The patients’ response to treatment was assessed at baseline and at weeks 2, 4, 8, 12, 16, 20 and 24. The primary efficacy end point was the percentage of patients achieving ⩾20% improvement as assessed by the ACR 20 response17 at week 24. Secondary end points included the ACR response rates (ACR 20, ACR 50 and ACR 70),17 Disease Activity Scores (DAS; assessment of 44 swollen joints and ESR),18 number of painful joints,19 number of swollen joints,19 morning stiffness (min), physician and patient global assessments (0–10 scales),19 Health Assessment Questionnaire (HAQ),20 pain Visual Analogue Scale (VAS),19 general health VAS, EuroQOL VAS,21 ESR and CRP at the aforementioned time points. Safety assessments were based on reports of adverse events and results of routine physical examinations and laboratory determinations. Treatment-emergent adverse events were defined as adverse events that were not present at baseline or events that were present at baseline but worsened during the study. Binary efficacy end points of ACR 20, ACR 50 and ACR 70 response rates were analysed using the Mantel–Haenszel χ2 test, stratified by study centre. For continuous and ordinal efficacy end points, including physician and patient global assessment of disease activity, pain VAS, number of swollen joints and painful joints, HAQ, ESR, CRP and morning stiffness, the changes from baseline were analysed with a two-way analysis of covariance with treatments and centre as factors and the baseline value as a covariate. The percentage improvement, defined as adjusted mean change per overall baseline mean, was also calculated for continuous and ordinal efficacy end points. All efficacy analyses were based on a modified intent-to-treat population, including all randomly assigned patients who received any test article and provided efficacy data at baseline and at any post-baseline evaluation. The efficacy analyses used the last-observation-carried-forward imputation approach to account for missing data at various time points. For comparisons of baseline demographic characteristics among treatment groups, a one-way analysis of variance with treatment as a factor was used for continuous or ordinal variables and Mantel–Haenszel χ2 test for binary variables. Adverse events (all and treatment-emergent) were summarised and compared among treatment groups, using Fisher’s exact test. The baseline data and adverse event comparisons were based on an intent-to-treat population, including all randomly assigned patients who received any test article. Of the total of 260 patients who were randomly assigned in the study, 254 received at least one dose of the study treatment (sulfasalazine, n = 50; etanercept, n = 103; and combination, n = 101). Demographically, the patients enrolled in this study constituted a typical population with rheumatoid arthritis, in that they were predominantly women and middle aged (table 1). We found no major differences among the groups in baseline characteristics other than the number of patients with a history of corticosteroid use. A total of 221 (87%) patients completed the study. Unsatisfactory response to treatment, the most common primary reason for discontinuation, was reported by more patients receiving sulfasalazine alone (24%) than by those receiving etanercept alone (1%) or etanercept and sulfasalazine (4%; p<0.001, sulfasalazine v etanercept or combination therapy). We found no significant difference in the percentage of patients (6% sulfasalazine, 6% etanercept, 1% combination) who withdrew because of adverse events. The primary efficacy variable, percentage of patients achieving an ACR 20 response, was significantly higher in both groups of patients at week 24, those receiving etanercept alone (73.8%) and those receiving combination therapy (74.0%), than in the group receiving sulfasalazine alone (28.0%; p<0.01; fig 1A). Similar significant differences among the treatment groups were seen in the ACR 50 (46.6%, 52.0% and 14.0%, respectively; p<0.01) and ACR 70 (21.4%, 25.0% and 2%, respectively; p<0.01) response rates at week 24 (fig 1B,C). 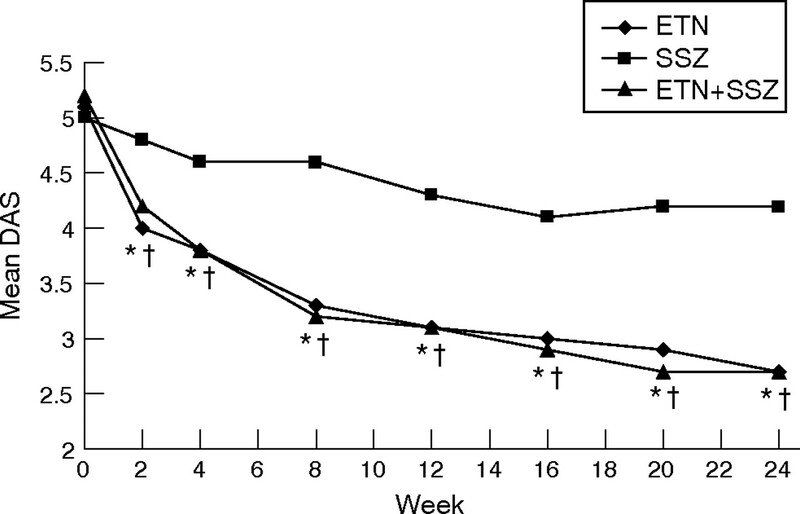 This difference was significant, starting at week 2 for ACR 20 and ACR 50 and at week 8 for ACR 70 (fig 1A–C). Response rates were not significantly different between the two groups receiving etanercept. Percentage of patients in each treatment group achieving an American College of Rheumatology (ACR) criteria response over time (in weeks; last-observation-carried-forward, modified intent-to-treat analysis). (A) ACR 20 responders. (B) ACR 50 responders. (C) ACR 70 responders. Pairwise comparisons: *p<0.05, sulfasalazine (SSZ) versus etanercept (ETN); †p<0.05, SSZ versus combination (ETN+SSZ); ‡p<0.05, ETN versus ETN+SSZ. Control of disease activity as assessed by DAS paralleled the response assessed by the ACR criteria (fig 2) and was significantly greater in the group receiving etanercept than in that receiving sulfasalazine alone starting at week 2 (p<0.01). Significantly higher improvement in DAS was seen at week 24 in the groups receiving etanercept (48.2%) and combination (49.7%) than in that receiving sulfasalazine alone (19.6%; p<0.01, etanercept or combination v sulfasalazine). 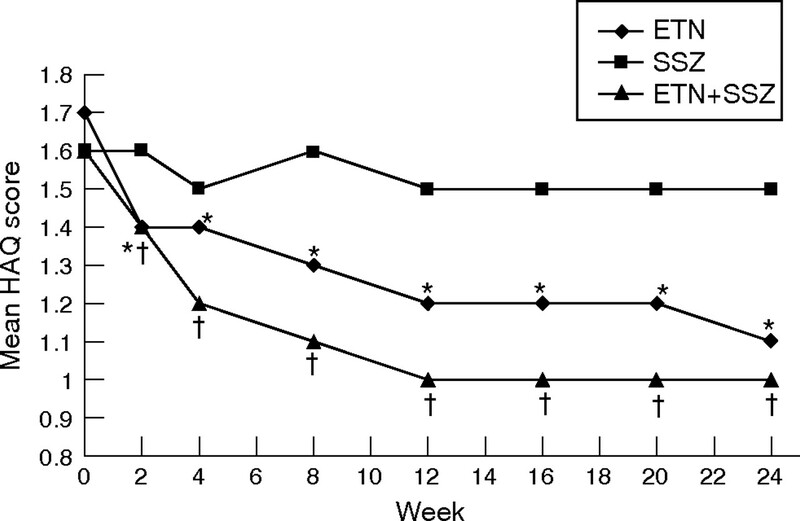 For all efficacy variables assessed, etanercept, alone or in combination with sulfasalazine, resulted in similar improvement from baseline to week 24, which was significantly higher than the improvement resulting from continuation of sulfasalazine. Significant improvement (p<0.01) was seen as early as 2 weeks, the first visit after the treatment intervention. Table 2 shows the percentage improvement at week 24 for a selected set of variables. Mean Disease Activity Score (DAS) over time (in weeks; last-observation-carried-forward, modified intent-to-treat analysis). Pairwise comparisons: †p<0.05, sulfasalazine (SSZ) versus combination (ETN+SSZ); ‡p<0.05, etanercept (ETN) versus ETN+SSZ. Outcomes reported by patients, as measured by the HAQ, EuroQOL and general health VAS, were significantly improved in the groups receiving etanercept compared with those continuing sulfasalazine alone (p<0.01). Improvements in physical function, as measured by mean HAQ scores, started at week 2 and were sustained to week 24 (p<0.01; fig 3). Similar results were seen with the pain VAS (p<0.01). At all visits, the improvements in both the groups receiving etanercept were not different from each other. Mean Health Assessment Questionnaire (HAQ) scores over time (in weeks; last-observation-carried-forward, modified intent-to-treat analysis). Pairwise comparisons: †p<0.05, sulfasalazine (SSZ) versus combination (ETN+SSZ); ‡p<0.05, etanercept (ETN) versus ETN+SSZ. The improvement in CRP and ESR, in both the groups receiving etanercept, was significantly greater than that in the group receiving sulfasalazine (from week 2 onwards; p<0.01). From week 4 to week 20, ESR levels in the group receiving the combination were significantly lower than those in the group receiving etanercept alone (p<0.05). However, at week 24, the difference between the two groups receiving etanercept was not significant. The frequency of adverse events other than infections was similar across all treatment groups (table 3). Etanercept alone was associated with significantly fewer reports of headache, asthenia and nausea than the combination or sulfasalazine alone; injection site reactions (ISRs) were reported more frequently in the groups receiving etanercept alone than in the group receiving either the combination or sulfasalazine alone. Agranulocytosis was not reported during the study. Fever was reported more often in the group receiving sulfasalazine than in the one receiving etanercept. No cases of tuberculosis were reported during the study. We noted significantly more infections (p<0.05) in the group receiving etanercept (47 (45.6%)) than in the group receiving either sulfasalazine (13 (26.0%)) or the combination (31 (30.7%)). We found no significant differences among the three treatment groups for any individual infection. In this study, a significant decrease in mean white blood cell (WBC) counts was observed in patients receiving the combination compared with those receiving either monotherapy (p<0.001), although the difference between the two groups receiving monotherapy was not significant. However, the mean, as well as most WBC counts in the combination group, was within the normal range (at week 24, mean WBC count in this group was 6.647×109 (range 2.900–11.800×109) cells/ml). The decrease in mean WBC count was not associated with any increase in specific adverse events or infections in the combination group, and no patients discontinued because of leucopenia. Mild leucopenia (lowest WBC count 2.7×109 cells/ml) was reported in six patients (combination (n = 5), etanercept (n = 1); not significant), but all events were transient in nature and reverted to normal while the patients continued in the study. Three infections (sinusitis, pharyngitis and septic arthritis) that were considered serious (requiring hospitalisation or treatment with parenteral antimicrobial agents) occurred in two patients receiving etanercept. In all, 3 (2.9%) patients receiving etanercept, 5 (5.0%) receiving the combination and 1 (2.0%) receiving sulfasalazine experienced non-infectious serious adverse events (those associated with hospitalisation or classified as medically important). Only three of these patients, one from each treatment group, discontinued from the study because of the adverse event. The differences among the treatment groups were not significant. No patients died during the study. Two patients who received etanercept alone were diagnosed with a malignancy or a premalignant condition during the study; one with a history of skin cancer developed an actinic squamous cell carcinoma on his lower lip and was later discontinued from the study because of lack of efficacy, and the other was diagnosed with myelodysplastic syndrome after 12 weeks of treatment, which led to acute myelogenous leukaemia after the patient was withdrawn from the trial. The patient died of complications associated with this condition about 6 months after withdrawal. The objective of this study was to determine whether patients receiving stable treatment with sulfasalazine, possibly the second most prescribed DMARD in Europe (after methotrexate), without achieving full therapeutic response, could benefit either from switching to etanercept or from adding etanercept to their existing treatment with sulfasalazine. We found that patients treated with etanercept, alone or added to sulfasalazine, showed a rapid and sustained improvement in all efficacy variables compared with those receiving sulfasalazine alone. The improvement seen with the etanercept monotherapy group in this study was similar to that seen in previous trials.8,22 Improvements were seen as early as the first scheduled assessment—that is, after 2 weeks of treatment—and were persistent. The percentage of ACR 20 responders in the two groups receiving etanercept tended to level off after the first 12 weeks, but the percentage of responders achieving the stricter ACR 50 and ACR 70 measures continued to rise throughout the 24 weeks. The differences between etanercept alone and the combination treatment were minor and inconsistent: a faster onset of response was seen with etanercept alone in the counts of swollen and painful joints and in ACR 50, whereas the combination produced a noticeably greater reduction in ESR (but not in CRP) at several time points. All three treatments were well tolerated. Although the group remaining on unchanged sulfasalazine treatment benefited from pre-trial selection, no substantial safety advantage was detected for the group continuing sulfasalazine. As expected, both groups receiving etanercept had significantly more patients with ISRs than did the group receiving sulfasalazine. Reports of infectious adverse events were higher with etanercept monotherapy than with sulfasalazine monotherapy or the combination therapy, but we found no difference in incidences of serious infections. Tuberculosis was not reported in any of the three treatment groups. The non-infectious adverse events, including headache, asthenia, nausea and pruritus, tended to occur more often with the combination than with etanercept alone and the difference reached significance for some common adverse events. Although the mean difference in WBC counts for the group receiving combination was statistically lower than for the group receiving either monotherapy, the lower WBC counts did not seem to be clinically relevant. No reports of serious adverse events or discontinuations from treatment were associated with the low WBC counts. We observed no significant differences among the groups in the development of malignancies. The safety and efficacy of sulfasalazine in combination with anti-TNF treatment has not been extensively studied in randomised clinical trials. In the only other placebo-controlled trial evaluating sulfasalazine, the safety trial of adalimumab in rheumatoid arthritis, adalimumab was added to the existing treatment in patients with active rheumatoid arthritis whose disease was not adequately treated by their current DMARD24 (http://www.fda.gov/cder/biologics/products/adalabb123102.htm). However, because of the small numbers of patients in each subgroup (sulfasalazine alone, n = 33; and sulfasalazine and adalimumab, n = 29), it is difficult to compare treatment arms. Furthermore, the safety trial of adalimumab in rheumatoid arthritis study did not include an adalimumab-alone arm. Overall, the combination of etanercept and sulfasalazine was as effective as etanercept alone and patients showed a marked improvement over the previous sulfasalazine treatment in the clinical efficacy measures assessed. Sulfasalazine may be safely complemented or replaced by etanercept, without any meaningful clinical efficacy advantage for the combination regimen. Adding etanercept in a step-up approach to sulfasalazine did not seem to offer any clinical advantage over switching to etanercept, which is in agreement with recent studies on combination therapies with other DMARDs.25 However, in the absence of radiography data, it is not known whether these clinical results would be directly correlated with benefit from radiography. No unwanted immunological response was detected. ISRs occurred less often with the combination than with etanercept alone. In conclusion, etanercept in combination with or substituted for sulfasalazine resulted in substantial improvements in the signs and symptoms of rheumatoid arthritis in patients who had active disease despite treatment with sulfasalazine. The overall results suggest that etanercept can replace sulfasalazine in patients with rheumatoid arthritis who show an inadequate response to sulfasalazine. This study was supported by Wyeth Research, Collegeville, Pennsylvania, USA (study drug and grants to investigational sites). We thank Donna Simcoe and Ruth Pereira from the Wyeth Clinical Publications Group for their support in writing this manuscript. Lawrence RC, Helmick CG, Arnett FC, Deyo RA, Felson DT, Giannini EH, et al. Estimates of the prevalence of arthritis and selected musculoskeletal disorders in the United States [comment]. Arthritis Rheum1998;41:778–99. Pincus T, Callahan LF. The ‘side effects’ of rheumatoid arthritis: joint destruction, disability and early mortality. Br J Rheumatol1993;32 (Suppl 1) :28–37. Pincus T, Sokka T, Wolfe F. Premature mortality in patients with rheumatoid arthritis: evolving concepts [comment]. Arthritis Rheum2001;44:1234–6. Mohler KM, Torrance DS, Smith CA, Goodwin RG, Stremler KE, Fung VP, et al. Soluble tumor necrosis factor (TNF) receptors are effective therapeutic agents in lethal endotoxemia and function simultaneously as both TNF carriers and TNF antagonists. J Immunol1993;151:1548–61. Bathon JM, Martin RW, Fleischmann RM, Tesser JR, Schiff MH, Keystone EC, et al. A comparison of etanercept and methotrexate in patients with early rheumatoid arthritis [comment] [correction appears in N Engl J Med 2001;344:240]. N Engl J Med2000;343:1586–93. Klareskog L, van der Heijde D, de Jager JP, Gough A, Kalden J, Malaise M, et al. Therapeutic effect of the combination of etanercept and methotrexate compared with each treatment alone in patients with rheumatoid arthritis. Lancet2004;363:675–81. Weinblatt ME, Kremer JM, Bankhurst AD, Bulpitt KJ, Fleischmann RM, Fox RI, et al. A trial of etanercept, a recombinant tumor necrosis factor receptor:Fc fusion protein, in patients with rheumatoid arthritis receiving methotrexate. N Engl J Med1999;340:253–9. Smolen JS. Efficacy and safety of the new DMARD leflunomide: comparison to placebo and sulfasalazine in active rheumatoid arthritis. Scand J Rheumatol Suppl1999;112:15–21. Dougados M, Combe B, Cantagrel A, Goupille P, Olive P, Schattenkirchner M, et al. Combination therapy in early rheumatoid arthritis: a randomised, controlled, double blind 52 week clinical trial of sulphasalazine and methotrexate compared with the single components. Ann Rheum Dis1999;58:220–5. Haagsma CJ, van Riel PL, de Jong AJ, van de Putte LB. Combination of sulphasalazine and methotrexate versus the single components in early rheumatoid arthritis: a randomized, controlled, double-blind, 52 week clinical trial. Br J Rheumatol1997;36:1082–8. Boers M, Verhoeven AC, Markusse HM, van de Laar MA, Westhovens R, van Denderen JC, et al. Randomised comparison of combined step-down prednisolone, methotrexate and sulphasalazine with sulphasalazine alone in early rheumatoid arthritis. Lancet1997;350:309–18. van der Heijde DM, van Riel PL, Nuver-Zwart IH, Gribnau FW, vad de Putte LB. Effects of hydroxychloroquine and sulphasalazine on progression of joint damage in rheumatoid arthritis. Lancet1989;1:1036–8. Smolen JS, Kalden JR, Scott DL, Rozman B, Kvien TK, Larsen A, et al. Efficacy and safety of leflunomide compared with placebo and sulphasalazine in active rheumatoid arthritis: a double-blind, randomised, multicentre trial. European Leflunomide Study Group. Lancet1999;353:259–66. Hochberg MC, Chang RW, Dwosh I, Lindsey S, Pincus T, Wolfe F. The American College of Rheumatology 1991 revised criteria for the classification of global functional status in rheumatoid arthritis. Arthritis Rheum1992;35:498–502. Felson DT, Anderson JJ, Boers M, Bombardier C, Furst D, Goldsmith C, et al. American College of Rheumatology. Preliminary definition of improvement in rheumatoid arthritis [comment]. Arthritis Rheum1995;38:727–35. van der Heijde DM, van’t Hof M, van Riel PL, van de Putte LB. Development of a disease activity score based on judgment in clinical practice by rheumatologists. J Rheumatol1993;20:579–81. Felson DT, Anderson JJ, Boers M, Bombardier C, Chernoff M, Fried B, et al. The American College of Rheumatology preliminary core set of disease activity measures for rheumatoid arthritis clinical trials. The Committee on Outcome Measures in Rheumatoid Arthritis Clinical Trials. Arthritis Rheum1993;36:729–40. Hurst NP, Kind P, Ruta D, Hunter M, Stubbings A. Measuring health-related quality of life in rheumatoid arthritis: validity, responsiveness and reliability of EuroQol (EQ–5D). Br J Rheumatol1997;36:551–9. Moreland LW, Baumgartner SW, Schiff MH, Tindall EA, Fleischmann RM, Weaver AL, et al. Treatment of rheumatoid arthritis with a recombinant human tumor necrosis factor receptor (p75)-Fc fusion protein [comment]. N Engl J Med1997;337:141–7. Mathias SD, Colwell HH, Miller DP, Moreland LW, Buatti M, Wanke L. Health-related quality of life and functional status of patients with rheumatoid arthritis randomly assigned to receive etanercept or placebo. Clin Ther2000;22:128–39. Smolen JS, Aletaha D, Keystone E. Superior efficacy of combination therapy for rheumatoid arthritis: fact or fiction? Arthritis Rheum2005;52:2975–83. Competing interests: CC received investigator fees for carrying out Wyeth trials. UF was paid by Wyeth Italia for running educational programmes. MG was reimbursed by Wyeth for attending several conferences and was paid for giving educational talks. PPG received support for clinical studies from Wyeth Research. TKK was a consultant and a speaker for Wyeth and received funds for research. JW and SF are employees of Wyeth Research. Etanercept Study 309 Investigators in Europe and Australia (other than the authors): Maxime Dougados, Hopital Cochin, Paris, France; Joël Dehais, Hopital Pellegrin, Bordeau, France; Philippe Goupille, Hopital Trousseau, Tours, France; Pierre Miossec, Hopital E Herriot, Lyon, France; Anett Grässler, University Hospital, Dresden, Germany; Umberto Ambanelli Universita di Parma, Parma, Italy; Silvano Todesco, Policlinico Universitario, Padova, Italy; Hillary Capell, Glasgow Royal Infirmary, Glasgow, UK; Ian Griffiths, Freeman Hospital, Newcastle upon Tyne, UK; Richard Hull, Queen Alexandra Hospital, Portsmouth, Hampshire, UK; George Kitas, Corbett Hospital, Stourbridge, West Midlands, UK; Robert Moots, Fazakerley Hospital, Liverpool, UK; David G I Scott, Norfolk and Norwich Hospital, Norwich, UK; David L Scott, Dulwich Hospital, London, UK; Peter Sheldon, Leicester Royal Infirmary, Leicester, UK; Bryan Williams, University Hospital of Wales, Cardiff, South Wales, UK; Gary Wright, Musgrave Park Hospital, Belfast, UK; Paresh Jobanputra, University of Birmingham, Birmingham, UK; Knut Mikkelsen, Lillehammers sanitetsf rening, Lillehammer, Norway; Olav Bjorneboe, Martina Hansens Hospital, Gjetterum, Norway; Petr Vitek, Centrum Rehabilitace, Zlin, Czech Republic; Ladislav Bortlik, NZZ Bormed, Ostrava, Czech Republic; Marie Sedlackova, Thomayer University Hospital, Praha, Czech Republic; Sevda Augustinova, Medipont, (Jerzy Lech) Ceske Budejovice, Czech Republic; Peter Nash, Sixth Avenue Specialist Centre, Maroochydore, Australia; Stephen Hall, Cabrini Medical Centre, Malvern, Australia; Florin Radulescu, Ambulatoriul Centrului Metodologic de Reumatologie, Bucuresti, Romania; Coman Tanasescu, Institutul de Medicina Interna, Bucuresti, Romania; Horatiu Bolosiu, Spitalul Clinic Judetean Cluj, Cluj-Napoca, Romania.